The Kingston DataTraveler Reader is about the size of a Bic lighter, but is a lot more fun. 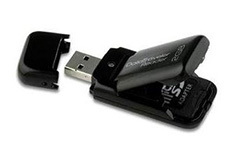 With its USB 2.0 connector, it can quickly transfer data from SD, SDHC, MMC, and MMCplus cards in the blink of an eye. With the appropriate adapters, the DataTraveler can also handle miniSD, microSD, RS-MMC, MMCmobile, and MMCmicro. I've been using the DataTraveler to transfer images from SanDisk 4GB SDHC cards. It became my "go to" card reader when I discovered that my previous reader couldn't handle the new SDHC format. When you insert the SD card into the DataTraveler, then plug it into a USB port, two drive icons appear on the desktop. One is for the memory card and the other is 2 GBs of free memory available on the reader itself. This extra memory is a great place to back up your pictures once you've transferred them to your computer. You can also store other data on the card such as documents and music. When you want to eject the reader, be sure to remove both drive icons before pulling the reader from the USB port. The DataTraveler also includes a green LED to show operational status and a short lanyard so the device can be used as a key ring. The 2GB model sells for about $42 US on Amazon. It's fast, compact, and accepts the latest memory cards, including SDHC -- and the 2GBs of onboard memory is a real bonus. 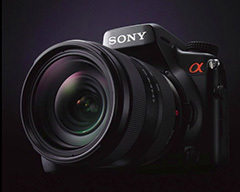 Sony's new DSLR A-700 is a high performance capture device capable of competing with Canon's new 40D and Nikon's D300. At $1,499 US (including an 18-70mm zoom), this solid body features a 12.24 MP Sony Exmor CMOS sensor, a Bionz image processor that screens out noise before Raw data conversion, and sensor-based image stabilization that works with any lens mounted on the camera. The A-700 can capture at 5 fps, includes a 3" LCD, offers an accessory vertical grip, and features a nice array of system lenses. There's an in-depth review of the Sony A-700 on PhotoReview. Serious photographers who haven't committed to another system should consider this body among the other elite contenders. Others looking for a body with sensor-based stabilization should also look closely at the A-700. Based on initial reports, Sony has done a great job here. Last week I posted a heads up about Rick Smolan's America at Home Project. The site is now live and they are accepting images until Sept. 23, 2007. This is a great opportunity for you to participate in this high profile photo project. Just visit the America at Home site and click on Pro Photo Tips for all the details. While you're there, take a moment to learn more about the project. I hope you have a chance to submit a photo. 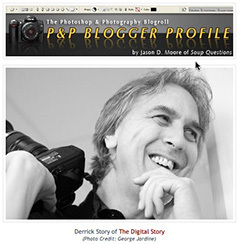 Jason Moore publishes regular interviews with photographer bloggers and had sent me a list of interesting questions for his P&P Blogger Profile. He asked standard questions such as "Why do you blog?" but he also wandered off the beaten path with inquires about inspiration, creativity, tools, and even personal stuff under the heading of "From Inside the Actors Studio." My favorite exchange of the interview was, "What advice do you have for a novice creative professional/photographer?" with my answer being, "Get a photo buddy and/or become part of a photography community. If you have someone to go shooting with, and who will look critically at your photos, you will shoot more and improve faster. As for community, the nickname for The Digital Story is “your virtual camera club.” It’s a place for photographers to come together, learn new techniques, show off their pictures, and get feedback on their work. Being part of a community helps us improve as artists and craftsmen." If you want to know a little more about the man behind the TDS blog, you might enjoy this interview of me. Read at your own risk. Rick Smolan and the team that produced A Day in the Life of America: America 24/7, is tackling their biggest challenge to date: "America at Home." The entire American population is being invited the week of September 17th-23rd to participate by taking digital photographs of what "Home" means to them, and then submitting them to MyAmericaAtHome.com. The end result will be a mixture of photos from the public and the 100 professionals who will also be capturing images of what defines the home. The photos will then go into a coffee table book titled, "America at Home" to be released in March of 2008. When the book is released, buyers will have the option of personalizing it by putting their own family pictures on the photo jacket. If you have a good idea for an entry, start making plans now for your shoot the week of September 17. I think it would be very exciting to have your image included in this book. I will cover this project more once it gets underway. For more information, you can also read the official press release. You can create a variety of effects in iPhoto 7 (part of iLife '08) that rival what you can do in more advanced applications such as Photoshop CS3. 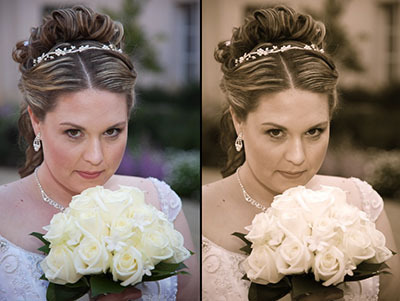 One of these effects, "Antique," is a good one to consider for bridal portraits and family group shots. And best of all, it's easy to apply. First duplicate your color image in iPhoto (Photos > Duplicate). Then click on the "Edit" icon at the bottom of the window (it's the pencil) to put you in edit mode. Once there, click on the "Effects" icon to open its palette, the choose "Antique." iPhoto will apply the effect to your image. You can increase or decrease its impact by clicking to the right or left of the number that appears in the effect icon. I usually settle for a setting of 3 or 4. You're not finished yet. Now click on the "Adjust" icon to open its palette. Many iPhoto users don't realize that you can continue to play with the Antique effect by moving the Temperature and Tint sliders until you get the perfect look you're seeking. You may also want to make some final exposure adjustments while you have the palette open. One final tip... you can sometimes smooth out skin blemishes by playing with the "Reduce Noise" slider. Don't overdo it, but a little noise reduction can enhance the the subject's appearance. Then click Done. You've now created a stunning Antique effect without ever leaving iPhoto. Bob Atkins has just published a helpful review of the Canon 40D. He tackles one of the biggest questions with this camera: is this a worthy upgrade for 20D and 30D owners? "In just about every respect the EOS 40D technically outperforms the EOS 30D," says Atkins, "and so I think it is a worthwhile upgrade for those who can afford to switch and who can use the new features. I didn't feel that way about the 30D, which was a good camera but for me didn't offer enough new features to persuade me to trade in my 20D and upgrade." As Atkins begins to really dig into the specifications of the 40D, you realize that this is really a new camera under the hood with more robust image processing capabilities. "It's basically a new camera with a new sensor," says Atkins, "a new 14-bit processing engine, a new AF system and new features such as Live View, Highlight Priority and High ISO noise reduction as well as improved ergonomics with the enhanced 3" LCD. Though it looks much like the 20D/30D it seems to have a more "pro" feel--though I'm not sure why. Perhaps it's the quieter and faster shutter operation that simply makes it sound better!" When I look at the 40D, I first think performance. For $1,299 US, you get a camera that fires at 6.5 fps with a buffer that can hold 17 Raw files per burst. That means you can shoot action photography in Raw. Add to this the AF system with 9 cross type sensors, the DIGIC 3 processor, and 14-bit A/D conversion, and you have machine capable of handling just about any assignment. The Bob Atkins review also does a good job of covering the 40D's image noise performance, auto-focusing ability, and Live View (on that new 3" LCD with broader color gamut). Both the Canon 40D and the Atkins review of it are worth a look. Adobe's announcement of Photoshop Express was the most interesting news for me at the recent Photoshop World in Las Vegas. This Rich Internet Application (RIA) will allow users to adjust their photos via a web browser instead of using an application that resides on their hard drive. This is particularly useful for travelers using a variety of public computers in conjunction with online photo services such as Flickr. My current favorite image editor of this type is Picnik, which I think works very well. Photoshop Express, as well as Picnik, are free RIA applications. There's been no firm date for the release of Express, but I imagine we will hear more about it in the coming weeks. I'll keep you posted. Screenshot of Photoshop Express compliments of John Nack. Epson is offering refurbished models of their P-2000 multimedia storage viewer for $253.15 on their web site. The P-2000 features a 3.8" Photo Fine LCD, 40GB hard drive that accepts direct upload from CF and SD memory cards, and Hi-Speed USB 2.0 interface for connecting to your computer. Recently I wrote about the Digital Foci PSF-250 Photo Safe that also accepts images right off your memory card, but doesn't allow you to view them. For those of you who want to see your pictures as well as store them, this is the best price I've seen for a factory refurbished Epson. 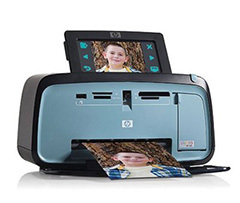 The HP Photosmart A626 Compact Photo Printer produces lab-quality output up to 5"x7", includes a 4.8" touchscreen LCD display, and accepts common memory cards for computerless printing -- all in a package that weights less than 4 pounds and is about 10" wide. It even has a popup handle for easy toting. The A626 uses HP inkjet technology for prints up to 4800 x 1200 dpi via USB, PictBridge, or one of its four memory card slots. Generally speaking, it produced beautiful 4"x6" prints in about 1:30, and 5"x7"s took about 2 minutes. An HP 110 ink cartridge can produce about 120 4"x6" prints. If you buy the ink and paper together ($34.99), your cost per 4"x6" print is around 29 cents. The images look every bit as good as lab quality, including a smudge and fade resistant surface. The HP A626 has a few basic image editing tools, such as brightness, red eye correction, and cropping. They don't have the power of what you can do on your computer, but they do come in handy when printing directly from the memory card. I used cropping and brightness quite often with good results. The LCD is not a calibrated screen (nor would I expect it to be), so images look brighter and "cooler" on the LCD than what later appears in the print tray. After a few rounds however, I was able to anticipate the results that I could expect from my edits. There's also an array of creative features such as the ability to freehand draw on a picture, add type, convert to B&W, add frames and clipart, and the most interesting of them all... slimming. Use this feature with extreme care. It actually narrows your subject in an attempt to shed unwanted pounds. But what is really does is squeeze them inward causing the face to elongate. If you do try slimming, I recommend only applying it at the mildest level. I was not impressed with the B&W conversion either. The photos turned out dull and without snap. But the clipart was a hoot, and I actually had fun adding birthday balloons and other goodies to photos. The HP A626 has a number of nice touches that impressed me. I liked the ink status icon that was always visible in the upper left corner of the LCD. Working directly from memory cards seems much more efficient than printing via PictBridge that required your camera to be powered up. Plus, you don't get all of the editing and creative features when tethered via cable (but are available when printing with the card inserted into the printer). If you're a Raw shooter, then keep in mind that you need to use the Raw+Jpeg option on your camera. The A626 can read the Jpegs and enable direct printing from your memory card. 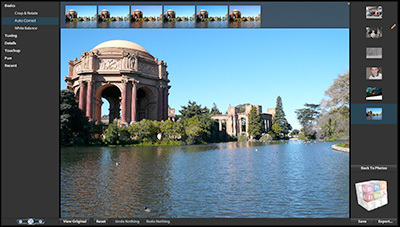 Later on, you can upload the Raw files to your computer for more precise image editing. This is a great way to enjoy pure amateur snap-shooting and serious fine art photography at the same time. It's also a nice touch that you can buy an accessory rechargeable battery for the printer to make it totally portable. There's a hidden bay on the bottom for this accessory. It would have been really cool to have the AC adaptor fit in the empty bay for those who don't purchase the battery. Unfortunately the adapter is a tad too thick for stowing there. Seems like a missed opportunity. I highly recommend the HP Photosmart A626 Compact Printer. The image quality is excellent, plus you can print up to 5"x7", and on a variety of media including CD labels, photo stickers, and passport photos. If you connect the printer to your Mac or PC, you have access to HP's excellent driver software, plus the A626 works as a standalone memory card reader. But this printer really shines when working solo on the kitchen counter or hotel room desk. Simple insert your memory card full of images, browse for your favorites on the bright LCD screen, make a few minor adjustments, then print. Suddenly you're free from the computer (and it feels good). The A626 is compact enough to easily fit in your suitcase or toss in the back of the car. This HP compact is available now for about $185 US.